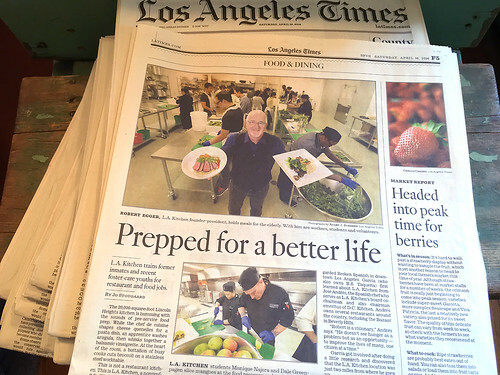 L.A. Bites Hunger founder Jo Stougaard wrote this article for the L.A. Times. The L.A. Kitchen is a nonprofit facility located in L.A.’s Eastside that recovers fresh fruit and vegetables to be used in a culinary arts job-training program for former inmates and young adults leaving the foster care system. They also create healthy meals for low-income seniors. In case you missed the print edition on Saturday, the online link is here. L.A. Bites Hunger will be organizing volunteer days at the L.A. Kitchen. Please comment with your email if you’d like more information.